Bitter Gourd vegetable is also known as bitter melon or balsam pear. Bitter gourd belongs to Cucurbitaceae family, which includes Squashes, melons, luffas and cucumbers. Its scientific name is Momordica Charantia. It is bitter in taste but it is enriched with several nutrients. Bitter gourd vegetable has two varieties: one that is oval, dark green in color and grows to 10cm length and the other one is 20cm in length, oblong in shape and pale green in color. Bitter gourd is mostly cultivated in the tropical parts of the world in Asia, South America and Africa. 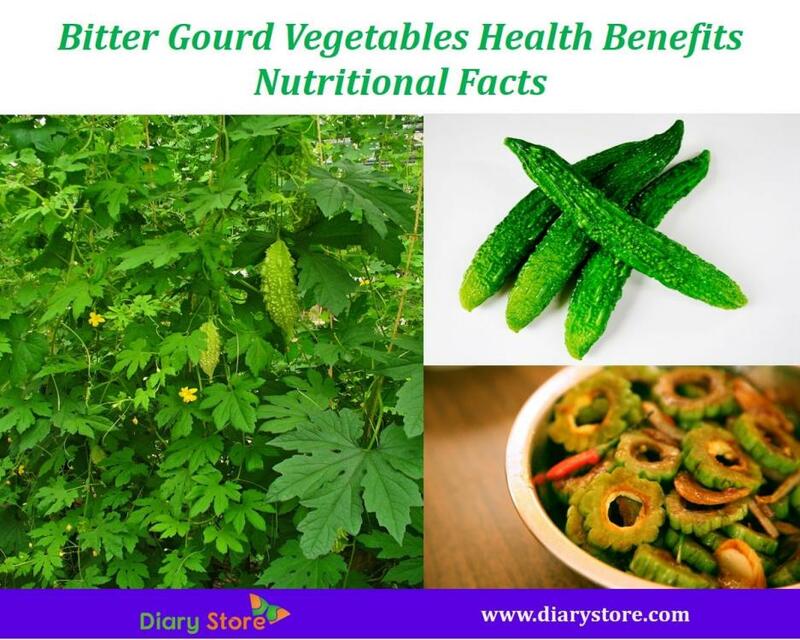 Bitter gourd vegetable is used as remedy for tumors, skin infections, hypertension and asthma. Bitter gourd contains antioxidants which help to fight against harmful bacteria and viruses and strengthens immune system. Antioxidants also help fight free radical damage that can cause various types of cancer. Bitter gourd is low in calories, carbohydrates and fat and high in fiber. Bitter gourd juice contains enzymes that breakdown fat into free fatty acids, thus reducing fat. Eating bitter gourd or drinking its juice every day is the best and easiest way to lose weight. Bitter gourd contains powerful antioxidants which help to fight against free radicals and improves eye sight and it also prevents cataracts. Bitter gourd contains vitamin C which helps, as said before, fight and eliminating free radicals, prevent skin diseases, psoriasis and eczema and wrinkles. Daily consumption of bitter gourd vegetable juice gives beautiful and healthy skin. Bitter gourd vegetable has antioxidant and antimicrobial properties. Consuming of bitter gourd juice helps to treat blood disorders, skin problems, remove the toxins from the blood and it also helps to cure diseases like itching caused by acne, rashes, blood boils and toxaemia. Bitter gourd has several vitamins, minerals which helps to remove dandruff, split ends and prevents hair loss. Daily consumption of bitter gourd helps you retain healthy and long hair. Bitter gourd juice is very helpful to asthma patients. It helps cure breathing problems and chronic cough by removing the sputum that accumulates within the lungs and the respiratory tract. 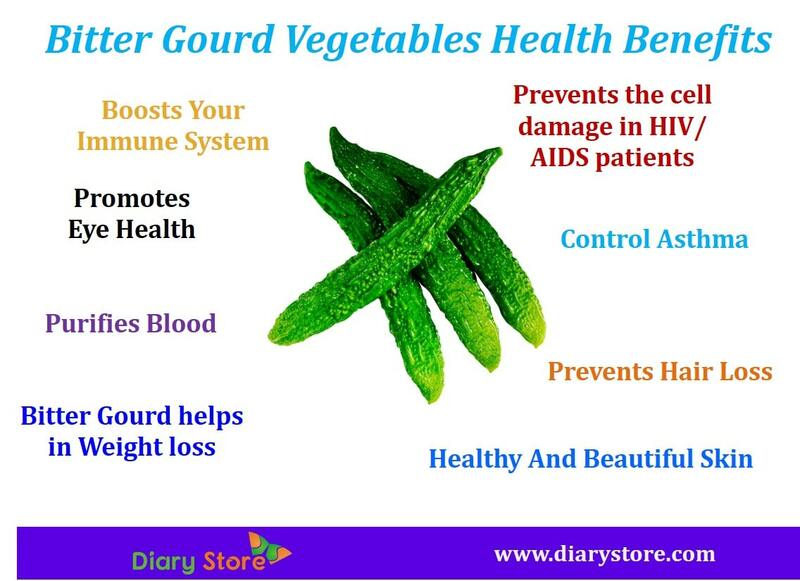 Bitter gourd juice is very helpful to HIV/AIDS patients. It helps to prevent further damaging of the skin cells. Consume bitter gourd juice every day in small quantities because it causes nausea and abdominal pains if taken in large quantity. Avoid too much consumption of bitter gourd during pregnancy. It contains chemicals that may induce menstrual bleeding. Bitter gourd juice in large quantities should be avoided in case of people who use medicines for treatment of diabetes because it may drop sugar levels to lower than normal. Which Vegetables Are Better to Eat After Cooked or Raw?